This film takes a large war and tells the story of a microcosm inside of it. Music is subtly played only to highlight dramatic moments. The camera is in your face like cinema verte style. We are always with the main characters to the end. There’s also a sweetness to it with the characters who play the nurses. They add humanity of the atrocities they have to face on a moment by moment basis. My name is Justin Lee and I write and direct independent films. Hardly anyone has heard of Hurtgen Forest outside of Veterans. So It was important to me to tell a small story during this battle to try and get more people curious and interested in learning more about it. The Battle Of The Bulge happened at the tail end of December '44 and overshadowed the Hurtgen battle in many ways. We lost more Americans there than any other battle in the war and for it to kind of fade into history to me is just tragic. So I think we wanted to try and give it a small voice in the best way we could. What was your research journey like? Did you travel to Germany before shooting? I have a Grandfather that served during the war and for years we have sat and talked, watched documentaries and read books together on all aspects of WWII. So I have always been a bit of a historian with the battles on the European front as well as the South Pacific. For this, I ended up getting a bunch of black and white footage of the Hurtgen forest and watching old news reels that were coming out of there at the time. We did our best to match the scenery of Hurtgen with our own location. The ferns, the evergreens, the desolation. I read countless journal entries from soldiers during that time as well as the Ranger's history in Hurtgen and the taking of Hill 400. I would look at hundreds of black and white photos. So, quite a bit I'd say went into it. I still have not been to Germany. It's on my bucket list to travel Europe and see Normandy, Paris, Hurtgen. I just have not had the time to be able to do such an extensive trip but it has always been something I have wanted to do since I was right out of high school. The film was shot just outside Oregon City near Portland, Oregon on a 15 acre piece of property. How long did it take you to shoot the film? We had 18 days to shoot the film. It was crazy. What were some challenges in shooting? Time is always a challenge. Doesn't matter the film. It always feels like you never have enough. Another big one on this was the FX. We went into this wanting to do total practical FX so doing all the explosions was somewhat challenging only because of supplies. Peter Tiemann and his team did an amazing job. They were running 40 miles away to find supplies because we had bought everyone out of everything in the Portland area. Any standout/memorable moments on set you'd like to share? The day we shot the scene with Falcone (Aidan Bristow) and Jackie (Kate Conway) at the tank. That was the day we first had a Nazi flag on set. That symbol brings with it a presence that you cannot describe. Moreso that it was an original flag. I think it was easy for Aidan to really deliver emotion there in that conversation because we were all really feeling the weight of that dialogue piece and what it meant. On right Aidan Bistow, Kate Conway on left center, and Matthew James McCarthy on top left. How did you plan out the fight sequences? Was there a rehearsal period before shooting began? The hand-to-hand stuff we walked through with Peter, made sure it was all safe and executed. We wanted to make sure things didn't look TOO choreographed because if these guys ever went at it without rifles, it was animalistic instincts kicking in for survival. In terms of the battles where we had gunfire, Anthony Bowman who was our historical adviser and worked with the Rangers from the Gulf War all the way through Afghanistan, helped coordinate how the Americans in a small unit and the Germans would move and flank. So we created our skirmishes and battles to how they would really do it. For example, the sniper scene. 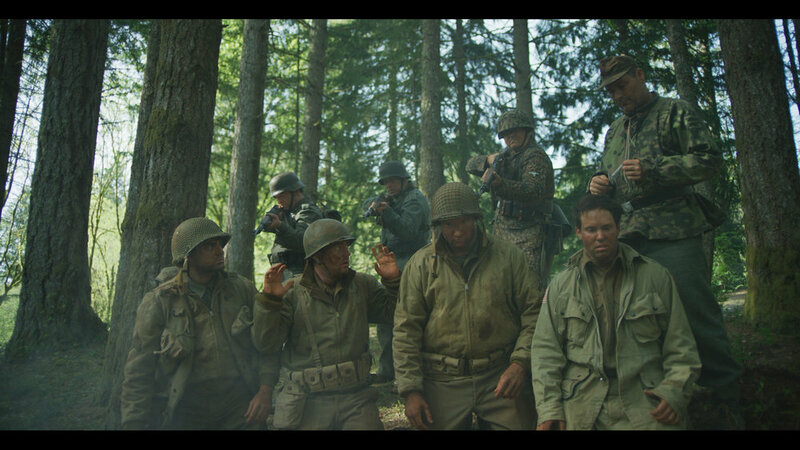 Our soldiers in the film spread out which is spreading the line of fire. The sniper now has a choice of staying where he is at and hoping they pass him or keep firing on one target. And in doing the latter, gives his position away. The tactics used were really interesting and many of those practices are still taught today in the branches of the military. I noticed that music was only in specific moments. Why did you use that choice? When working with Jared on the score, it never felt right to have music in every part of the film. You needed to let some things breathe or really be in tune with a conversation. Moments where a conversation heightens or a point is made, we bring in the music for dramatic effect. I can't stand watching films that are scored from opening credits to the close. I feel like it is used in some cases to cover things up. What do you love about filmmaking? I love the creation of ideas and images. When I see something in my head, put it down on paper and then create it in live action, it's special. The process of seeing something form out of an idea and be manifested into a physical state is just amazing. I love that. And I love telling stories. They might not be the best stories to everyone as we all have opinions. But if you can create a story that moves just one person, then it is all worth it. What was the shot design process behind the cinema verite esk style? This is the second film that Justin Janowitz, my Director Of Photography, and I have done together. When we were talking about how to shoot this project, we came up with the idea that we wanted to shoot a WWII film in a way that no one had ever done. We wanted the camera to float through scenes. Not hand held and shaky or big dolly shots. We wanted the audience to roll through a battle as if they were there. We wanted every bullet to whiz by them, to be right next to a grenade going off, etc. So we decided to shoot the film almost entirely on a gimbal. Janowitz would be running through shots, mud and dirt raining down on him. In one scene the ejected shell casings were pinging off the gimbal's frame and the camera housing itself because he was so close to the actor firing the rifle. It was amazing at what Justin was able to do with the setup we had. I truly feel like we did something that no other war movie has done in that regard and I think we are all very proud of that. The only scenes shot on sticks were some of the intimate conversations between soldiers and nurses. And that was a choice for we wanted the audience to be locked onto those characters in those moments and really be in tune with the development and journey some of these characters go through. A fishing pole. A hook. Flint. The book "Watership Down" by Richard Adams. And a pocketknife. What do you drink coffee or tea?